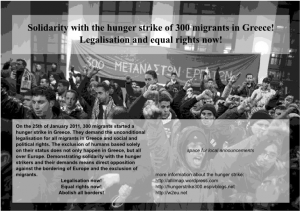 Declaration of solidarity with the hunger strikers in Greece – Legalisation and equal rights now – Call for a week of action! 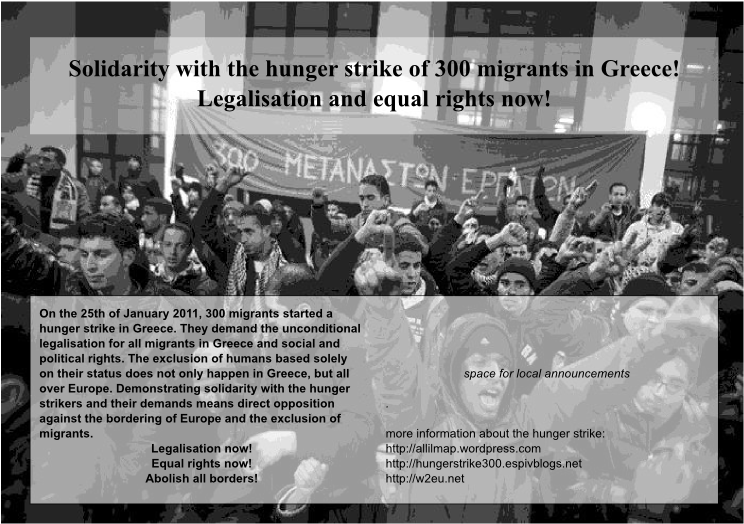 The 25th of January is the day on which 300 migrants in Greece started a hunger strike. Their demand is a collective legalisation of all the people excluded from Greek society based on their status – be it asylum seekers, not recognised refugees, illegalised people, exploited migrant labourers. Συνεχίστε την ανάγνωση Declaration of solidarity with the hunger strikers in Greece – Legalisation and equal rights now – Call for a week of action! Όλοι στην συγκέντρωση αλληλεγγύης στην πανελλαδική απεργία πείνας των 300 μεταναστών εργατών, Τρίτη 25-1, 6:00μμ στην Πλατεία της Αγοράς!